It's the thing every home owner dreads...a basement flood! Keep your basement dry with tips from our video. Whether you have flooded or not, part of this discussion will be based on principles of home plumbing and drainage reviewed in Causes of Basement Flooding. Additional resources are included at the end of this section. Table 1 is a summarized list of measures a home owner can take to protect their basement from flooding, the majority of which has been adopted from the Handbook for Reducing Basement Flooding (ICLR, 2009), which is an excellent resource on the topic. Proceeding Table 1 is additional information on each measure listed. If your home has a basement, you can have a basement flood. All measures listed will provide the knowledge and best practices on how to avoid a flood. However, the risk of basement flooding is never entirely avoidable. If you have a basement, there will always be a risk that conditions can occur that will cause a basement flood. Table 1 and the information below are means to reduce that risk. Part of reducing the risk of basement flooding for your home is having knowledge and a solid understanding of such things as the general flood risk of your area, what the municipality knows or does not know about it, insurance considerations, as well as basic knowledge about how your home’s plumbing and drainage systems work. The following section discusses five things you can do to improve your knowledge of flood risks and implications. Stormwater, storm sewers and general surface drainage issues are managed by City Engineering. Sanitary sewers and treatment are managed by Utilities Kingston. Whether your home has experienced basement flooding or not, one place to get started is your local municipality. In the City of Kingston, drainage servicing in the urban area is the responsibility of both the City of Kingston Engineering Department and Utilities Kingston. Call the City’s Customer Service Representatives at (613) 546-0000. They will help direct your queries in the right direction. What can I do as a homeowner to protect myself and protect my neighbours? Basement flooding can occur at random locations, or it can occur in concentrated areas. Regardless, it is important to let the municipality know that your home has flooded, because it can help direct efforts to understand why flooding occurred there and may assist in identifying solutions for flood risk reduction in your area. The more reports that are filed from a given area, the more resources are likely to be committed to understanding the problem. Report your incident using the on-line Basement Flood Report. Call the City of Kingston Customer Service Centre at (613) 546-0000 with details of the event. Where is your sanitary sewer lateral located? Do I have trees on top of it? Does your home also have a storm sewer lateral? If so, where does it go? Do you have a backwater sanitary valve on your lateral? Do you know how to maintain it? How does your foundation drainage work? Is it connected in to the sanitary sewer? Do you have a sump and sump pumps? If yes, where do they discharge? Where do your downspouts go? Are they going into the sanitary sewer? To understand these elements of your home’s plumbing, you may wish to engage a licensed plumber who can conduct specialized testing or inspection, perhaps through using a video camera. Sometimes it is difficult to figure out how the foundation drainage works and where it drains to, and a video inspection may not be enough. Some of this learning may require some extra efforts from specialized contractors, such as camera inspections or dye-testing. The City and Utilities Kingston may have some of this information which is why it is worthwhile speaking to your municipality first. In Canada, insurance does not cover any flood damages related to “overland flooding”, including flooding that is caused by heavy rainfall, riverine flooding and all other sources of overland flooding. This also includes flooding occurring due to cracks in the foundation, or up through the sump, should any sump pumps fail to operate properly. Speak directly to your insurer to be 100% certain about the specifics of your own policy when it comes to sewage backups and water damage in general. Typical home insurance, on the other hand, does offer coverage for sewer backup, whether from the storm or sanitary sewer system. This coverage is not necessarily automatic. It is prudent to verify with your insurer that you are insured for sewage backups, and to review the stipulations of that coverage. For example, what would happen to your coverage if you were to make a claim? How does it affect your rates, or insurability? Learn about this aspect of your coverage to understand the implications and know what is covered and what is not. If your home is not insurable due to previous flooding claims, find out what you can do to reinstate coverage, if anything. Check the Preventative Plumbing Program Guide to see if you qualify for a financial assistance program. The sewer lateral has shared ownership. The municipality is responsible for the portion from the property line to the sewer main. The homeowner is responsible for the portion on private-property, generally from the property line to the home. Responsibility includes general maintenance and upkeep of this connecting pipe. 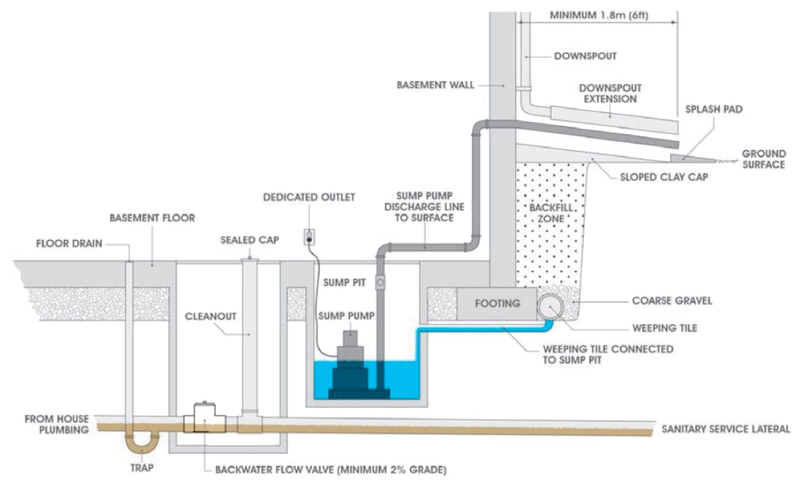 Sanitary sewage is the only thing that is permitted to be discharged to the sewer, and this means that connections from roof leaders, sump pumps and weeping tiles are all considered illegal connections (Clause 3.11). Not only do these connections increase your own risk of flooding, they also increase the risk of your neighbours flooding, and increase the occurrence of sewage bypasses to the environment. There are a number of simple things a homeowner can do to reduce their risk of basement flooding. Fats, oils and grease can cause a sewage backup because they have a tendency to solidify and accumulate in your internal plumbing, the sanitary lateral or the sewer main. While fat, oil and grease may be liquid when warm, they quickly cool and solidify as they flow through the plumbing pipe network. Flushing down with hot-water generally does not eliminate this risk, it may just get the substance a bit further down into the plumbing system. The municipality will not take responsibility for any blockage due to fat, oil or grease accumulation and blockage that is found on any portion of the lateral. For more detail, visit our Toilets and Drains page. While a rainy day may seem like a great time to get some domestic chores done, including doing laundry or running the dishwasher, it does increase flood risk for yourself and possibly your neighbours. To reduce the risk and reduce the load on the sewer system, wait until a few hours after heavy rains to undertake heavy water-use practices in the home. This helps you and your neighbours! This is particularly important if you have a backwater sanitary valve on your sanitary sewer. If the backwater sanitary valve is closed because the sewer is full, you risk flooding your home since your own domestic wastewater will not be able to drain to the sewer main. For more detail, visit our backflow prevention page. The lowest level of your home is your basement floor, and it is at the greatest risk of getting flooded. 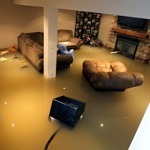 The basement floor is where water will accumulate first, and anything stored on the floor is at the greatest risk. If you do need to store items on the floor, consider lifting them up a bit on shelving or supports, or using water-tight containers. A big change in home use over the past 50 years has been the increased reliance on basement space as useable living space. Not only does this mean that basements are finished, but they may also be used as rooms for high-value items, such as recreation rooms or computing/gaming rooms, often equipped with expensive electronics and exercise equipment. In the insurance industry, this is considered to be the primary cause of a significant and consistent increasing trend in the average basement flood-related claim value, which is in the order of $15,000 to $20,000 per claim (2004/2005 figures), although $50,000-$100,000 is not unheard of. This trend indicates that homeowners are either unaware of the risk, or understand the risk and choose to take the risk to utilize the space. As mentioned above, all basements are at risk of flooding. Even making use of all the recommendations herein does not eliminate the risk, it just reduces it. A good example is sewer lateral maintenance. All shingle roofs will eventually leak, all driveways will crack, and eventually, all sewer laterals will fail, and unfortunately, failure of a sewer lateral is usually only detected when wastewater is coming up out of the floor drain. 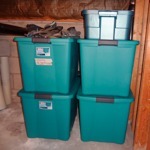 When planning how to use your basement space, this should be taken into consideration. The following lists some relatively simple and inexpensive measures a homeowner can do themselves to reduce flood risk. If they sound complicated or challenging, you may wish to consider hiring a qualified contractor. Catch basins are the storm sewer grates located on the street, and they are responsible for storm runoff drainage to the storm sewer. In some cases, you might even have one in your front or back yard. 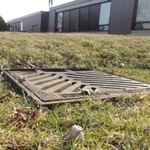 Often, particularly in the spring after snowmelt or in the fall when the leaves drop off the trees, catch basin grates can get blocked by debris that accumulates on top of them. This may cause or worsen localized street flooding, which may increase the risk of high groundwater levels and possibly surface flooding of neighbouring areas including homes, all occurrences that are not covered by insurance. If you know of a catch basin outside your house on the road or even on your lawn, or neighbour’s lawn, consider taking ownership of it and keeping it clear of debris. This simple activity might save you or your neighbour from flood problems. Catch basin maintenance is the responsibility of the City of Kingston Public Works Department, however, in certain times of the year, it is difficult for Public Works to maintain all catch basins at the same time. So, if you see one near you, and are willing and able, do yourself and your neighbours a favour and kick the leaves off of it. If not, call the Customer Service Representatives at (613) 546-0000. As mentioned earlier, while some insurers may offer it as an extra provision to your home insurance policy, in most cases, home insurance does not cover floods occurring from surface-water or ground-water getting into your basement, whether by direct overland routes of via cracks or holes in your foundation walls or floor. As with anything, foundations deteriorate over time. With this deterioration, and potential construction flaws and differential settling, cracks may form in your foundation, either on the walls or on the floor. When the groundwater level around your home is high, it may submerge these cracks and pressurize them to the point where they leak water. Leakage rates may be minimal, but they can also be substantial, depending in how much water there is near the crack, and how big the crack is. So, just like you get the shingles on your roof replaced, say every 10-15 years, it is also important to maintain your foundation. In many cases, you may be able to simply seal the cracks from inside the basement, without any need to dig. But for larger cracks, or particularly persistent ones, contracting the help of professionals may be required as these may be candidates for more substantial repairs done on the exterior of the house. You may wish to flip through the City’s Yellow Pages for “Foundation Repair” to help find a suitable contractor. Entry of water from overland flow paths are another form of flooding not covered by insurance. There are many potential overland flow paths, but generally this is referring to any path that allows surface water to get in. Such routes may include service holes into the basement, such as holes intentionally constructed for incoming electrical mains, or natural gas for powering a furnace for example. Routes also include gaps beneath doors, or leakage around aging window frames or window wells, among others. Home owners should take the necessary steps to ensure that all potential overland flow routes are properly sealed, and even better, also ensure that the source of the water at those points be diverted elsewhere by proper site grading. Note that reverse slope driveways and window wells are both forms of overland flow routes that are discussed in further detail later on. 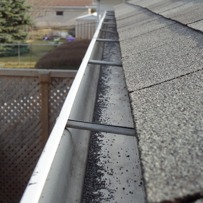 One good way to ensure effective drainage of your roof is to maintain your eavestroughs and downspouts. Ensure they are clear of debris and not partially or fully plugged. Plugged eaves and downspouts may result in water filling up and spilling over and discharging to locations close to the foundation. In addition, blockages allow for water to freeze and expand and break apart the seam on downspouts, such that water may spill out down the wall. A big rainfall is a great time to take a walk around your home, and make sure everything is working as it should. Looking up at a split downspout. This one is due to a blockage from roofing materials, then freezing in the winter. 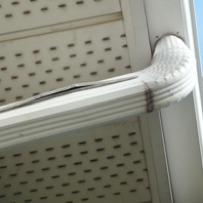 A typical eavestrough, clear of leaves and obstructions. While standard practice in the 1960’s and earlier, municipalities across the world have recognized that downspouts discharging to a sanitary system serve as significant contributors to sewer surcharging, bypasses and basement flooding. This is because during major rain storms, rooftops generate a considerable amount of run-off, not only in terms of volume, but also in terms of flow rate, since the runoff occurs very quickly off slanted roofs. It is currently illegal, by way of Clause 3.11 of By-law 2008-192, to have your roof’s downspouts discharging to the sanitary sewer system. How do you know if this is the case? 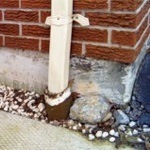 If your downspouts are entering a pipe that goes below grade, in all likelihood, you have illegal connections and should take the necessary steps to disconnect them. Best practice for downspouts, where feasible, is to discharge downspouts via extensions to a splash pad, and ultimately out to a grassy or otherwise permeable surface where the water can infiltrate naturally. 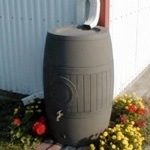 Consider adding a rain barrel to store some of that clean water for watering your lawn or garden! For more details visit our Downspouts page. Be sure that the discharge location keeps the water on your property, as it is illegal to create additional flood risk for a neighbour. In some circumstances, it is simply not possible to discharge all your downspouts to your own lawn or garden. Avoid discharging to a sidewalk or walkway. This could create a slip hazard. In some circumstances, exemptions may be available. In many cases, adding a two meter extension to the bottom of a downspout creates a trip hazard or an impediment for walking by your home. In these situations, consider a swivelling or folding downspout extension that would allow you to fold it up and away while say, cutting the lawn or hosting a social event. In general, lot grading should be done so as to promote the flow of water away from your home, or in other words, generally sloping the ground and surface features away from the foundation. This is how new homes are built, and generally “positive lot grading” is required by code. However, in terms of older homes, due to settling, manipulation of landscaping, new additions, or decks, positive lot grading is often neglected and typically deteriorates through settling over time. This may create situations that move water towards the house, which may increase flood risk. Ideally, you need to make sure that grading moves water to a swale, or natural drainage path, so it does not pool. In addition, consideration needs to be given to your neighbours. Please do not aggravate a neighbour’s drainage challenges or create a flood risk for your neighbour. Drainage from rear yard and back of house wraps around, between homes and towards the street. Rear yard drains to swale while the front yard drains towards the street. A swale is another word for a ditch. 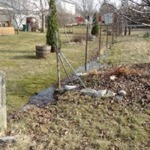 At times, a swale may exist on your property, and the job of that swale is to move collected water efficiently to a discharge points, which may be a rear-year catch basin, or a swale running between homes to a creek, for example. Be aware of these features and do not construct fences, or sheds or other features that will impede runoff into them, and flow in them to their destination. Doing so reduces their effectiveness. Sometimes during the building process, or after a development is completed, homeowners find there is a specific location, in their rear yards for example, that may be subject to repeated and persistent pooling of water. At times, private-side catch basins can be installed, or may have been installed by the developer, to prevent this from happening. If one does exist, it must be maintained and kept clear of debris. Should you have a location that is persistently flooded, you may also consider speaking with the City Engineering Department about installing one. While this needs to be done at the homeowner’s expense (or cost-shared with a neighbour), it may be a worthwhile investment, provided a suitable outlet (i.e., storm-sewer) is present nearby. The excavated area around your homes foundation is often disturbed through the construction process and thus backfilled with disturbed soil to fill the void. This soil is not nearly as compact as undisturbed soil and might serve as a preferential flow or drainage path for water near the foundation. In other words, this forms a column of soil that may hold more water, or may create a situation where water is drained along the foundation wall. Often, this backfilled area settles over time and reduces the grading and may, in fact, reverse the grading toward your home. Settled backfill areas should be filled and graded to drain away from the home. Ideally as well, a less permeable cover or surface is placed on top to promote flow away from your home and reduce the infiltration that may occur close to your foundation. To help design your rain garden, use this worksheet to calculate the amount of storm water that runs off your property and how quickly the soil drains. 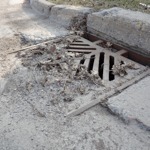 Learn more about the sewer system, storm water pollution, basement flooding, downspout disconnection, rainscaping, and more through this handout from a Utilities Kingston drainage workshop. Probably the biggest factor in keeping your basement dry is having a functioning, efficient and effective foundation drainage system. Foundation drainage will differ from home to home, from neighbourhood to neighbourhood. In fact, homes built pre- mid-1900’s, may not have any foundation drainage system at all. A plumbing inspection of your home can help you figure this out, although it may not be easy. Drainage materials, usually coarse gravel, around the foundation floor and outside the foundation walls. These materials allow for rapid flow of water, for drainage purposes. 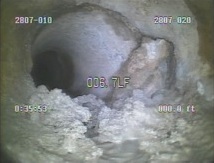 A connection to the sewer lateral. 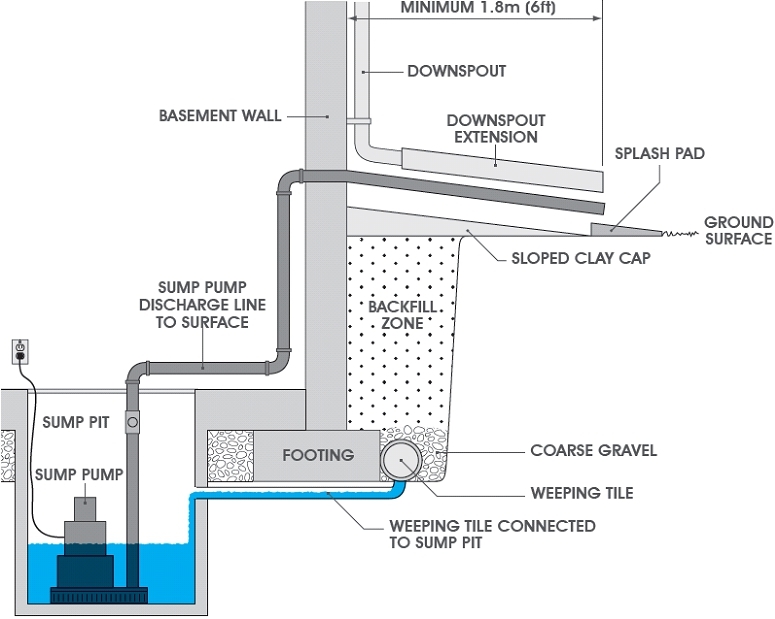 If you don’t have a sump pit, it is likely that your foundation drainage goes elsewhere. At times, the weeping tile simply takes the water further away from your home to infiltrate into drainage materials. Other times, the weeping tile may be connected into the sanitary lateral or a storm lateral. 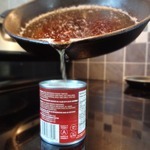 This type of connection is illegal by way of Clause 3.11 of By-law 2008-192. If you don’t have a foundation drain, and have basement dampness or wetness problems, or recurring flooding problems, consider having a weeping tile installed. This is not an inexpensive procedure, but a good functioning drainage system is essential for keeping a basement dry and usable. Weeping tile systems, as with the sewer lateral, are a feature of the home that requires maintenance. In general, over time, the effectiveness of the weeping tile system will deteriorate, as the pipe ages, or gets plugged with fine sediments, or collapses. Maintenance of the weeping tile system is critical, but unfortunately, it is not easy to get at. The only indication that the system is failing is usually increasing dampness or, more likely, a flood in the basement. Sometimes built-up sediment can be flushed out without totally excavating the weeping tile. However, if the pipe is collapsing or has deficiencies all around, full replacement may be required. Ideally during replacement, additional access points can be installed to permit future flushing and inspection of the system without excavation. Unfortunately, it used to be common practice to let a foundation drain go directly to the sanitary sewer lateral. The industry now recognizes that this puts otherwise clean water in the sanitary sewer system and this contributes to basement backups and bypasses to the environment. Not only does the extra water from the foundation contribute to these problems, but it also puts the homeowner at greater risk of basement flooding. Disconnecting a weeping tile from the sanitary sewer will help reduce the risk. This involves installing a sump pit and sump pump(s). 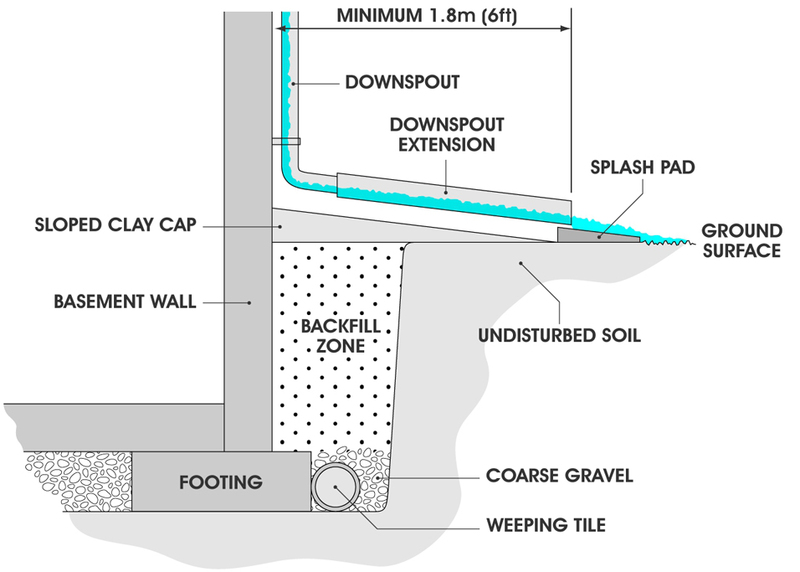 Ensuring that downspouts and surface drainage promote the flow of water away from the foundation will reduce the dependency on a sump system during rainfall. Groundwater around the home collected by the weeping tile should go to the sump pit and then be pumped away from the house using one or more sump pumps. This configuration severs home foundation drainage from both the sanitary and storm sewer systems and serves as the best means to control groundwater with the least risk. Sump pumps need to be sized properly, maintained, and provided with backup power. The outlet pipe from the sump pump is required, by law, not to go to the sanitary sewer system (By-law 2008-192). The best option is to direct the sump pump to the lawn, where it can infiltrate naturally into the ground. The discharge location should be at least 2.0 meters from the foundation and in no way create adverse conditions on a neighbour’s property. In a nutshell, this water is your own stormwater runoff, and you are required to accommodate it on your own property. Also, be sure that the location you choose to discharge it does not create a health and safety issue on your own property, a neighbour’s property, or on a public sidewalk or road. One example is freeze-up in the winter on a driveway, or worse, a public sidewalk. Proper sizing The rated power, or number of sump pumps will depend on how wet your foundation is. The installation contractor should be able to assist with this. Sometimes two smaller sump pumps are better than one larger one, as they can back each other up. Maintenance If you don’t maintain your sump pumps, they may not work when you most need them. Consider adopting a regular maintenance schedule and testing pumps once in a while. Follow the manufacturer’s recommendations. Backup power Most commonly available sump pumps run on electricity and will not run during a power failure. For redundancy, consider providing backup power to a second pump, whether by battery backup or generator. For even more detail about sumps, sump pumps, and options for discharging, visit our Sumps and Sump Pumps page. A backwater sanitary valve is a valve that generally permits one-way flow of water. In a nutshell, it is a valve that closes when the water level rises on the downstream side of the valve, thereby blocking flow in the reverse direction. When built into a sewer lateral, backwater sanitary valves may offer some protection against sewage backups. A backwater sanitary valve installed on the sanitary lateral must be “normally open”, which allows for the proper flow of sewer gases via the home’s ventilation stack(s). This also ensures that if failure should occur, the valve will fail in the open position. 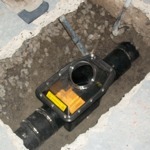 A backwater sanitary valve must be installed to the manufacturer’s specifications of placement and grading. If the backwater sanitary valve is installed upstream of a shower fixture for example, the valve will only protect those fixtures upstream of it, and the shower drain will still be at risk of a sewage backup. 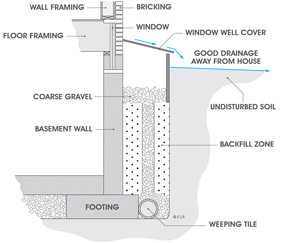 If a weeping tile (foundation drain) connects into the sewer lateral upstream of the backwater sanitary valve, the home will be at greater risk of flooding. The foundation drain will have no where to drain when the valve is closed. Maintenance is critical. A poorly maintained backwater sanitary valve will offer no protection against flooding. Knowledge and awareness are critical. During rainfall events, prior to using the shower, or doing laundry for example, the owner must be aware that there is a chance the valve is closed, and thus there is increased risk of flooding oneself when water is used within the home. Maintenance and know-how are critical for backwater sanitary valves operation. Despite the challenges listed above, when installed properly with adequate maintenance and awareness, a backwater sanitary valve can offer increased protection against sewage backup. Installing a backwater sanitary valve requires a plumbing permit and a licensed plumber to complete the work for you. For more detail, visit our backflow prevention page. Safety Alert! Gas lines may intersect the sewer line leading to your home. Equipment used to clear sewer lines could damage these intersecting gas lines, leading to possible gas leaks or a serious safety risk. Before clearing a blocked sewer line, call Ontario One Call at 1 800 400-2255 to schedule a free inspection to locate underground utility lines. Regular inspection and maintenance can protect you against a flood due to a failed sewer lateral. The sewer lateral is the pipe that connects your homes internal plumbing to the sewer main in the street. It is a vital component to the system, and if it is blocked, or fails, your home will experience a sewage backup. Your sewer lateral must be regularly maintained, generally, more frequently the older your home is. Inspection is the only way to observe and identify and address potential problems before a failure causes a sewage backup. Failures are not the only problem. 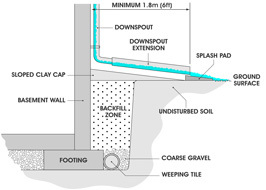 A cracked or leaky lateral that allows the infiltration of groundwater may increase the risk of flooding as well. Call a licensed plumber to see if they can offer this service. This service can also be provided by Utilities Kingston staff. Call (613) 546-0000 for more details. Generally, good sewer lateral maintenance will reduce the likelihood of a sewage backup. 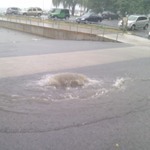 While a storm sewer lateral can provide a handy outlet for storm and groundwater, it also serves as an additional connection to a municipal system – the storm sewer. A bit different from the sanitary sewer in this regard, a storm sewer is actually designed to be full and surcharge, on average once every 2-5 years. 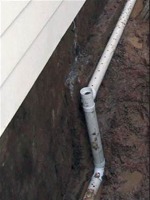 While it provides a handy outlet for downspout and foundation drainage, it also offers an added liability when the storm sewer is overflowing. If you don’t use it, consider having the storm lateral severed. An ideal spot is near the property line. This means you need to be directing your downspouts and foundation drainage to the lot’s surface for infiltration of your storm and groundwater and experience no excessive water on your property. Severance of the storm lateral will require a permit as well as the assistance of a contractor to undertake the work. A reverse-slope driveway is one that goes downhill towards the home, rather than downhill toward the road. Reverse-sloped driveways create a significant flood risk as they offer a distinct pathway for water towards the house, from the road. The road is typically part of the “major” storm drainage system – part of the storm drainage system that is used to provide drainage of storm runoff when the pipe system is full, generally every 2-5 years. Catch basins or drainage grates are usually located just outside the garage door on reverse slope driveways to capture any runoff, snowmelt or otherwise from the driveway. However, if the road is flooding and water is coming down from the road, often the catch basin has insufficient capacity to handle all that water. This creates a risk of surface flooding to the home, whereby water can enter the home via the garage or other pathways into the home at the basement level. Catch basins servicing reverse-sloped driveways should be connected to the storm sewer, not the sanitary sewer. If not provided by a sidewalk or otherwise, homeowners with reverse-sloped driveways should consider building in a small rise, roughly 15 cm or greater, relative to the road, to reduce the likelihood that road runoff flows down the driveway. A backwater sanitary valve may be useful on the connection to the reverse-sloped driveway catch basin to reduce the chances of flooding. Altering the drainage of a reverse-sloped driveway requires considerable work and expense, but is very useful in reducing the risk of flooding. Basement windows are often a weak point in the home’s defence against moisture. Window wells can help in a number of ways. For one, they are likely to improve the drainage around the window to ensure that the windows last longer. And they can help route water to the foundation drainage system, rather than in through the framing or the window itself. Install window wells around all windows that are close to, or below the lot’s surface. Installation of a window well should also include a drainage layer that extends to the weeping tile. 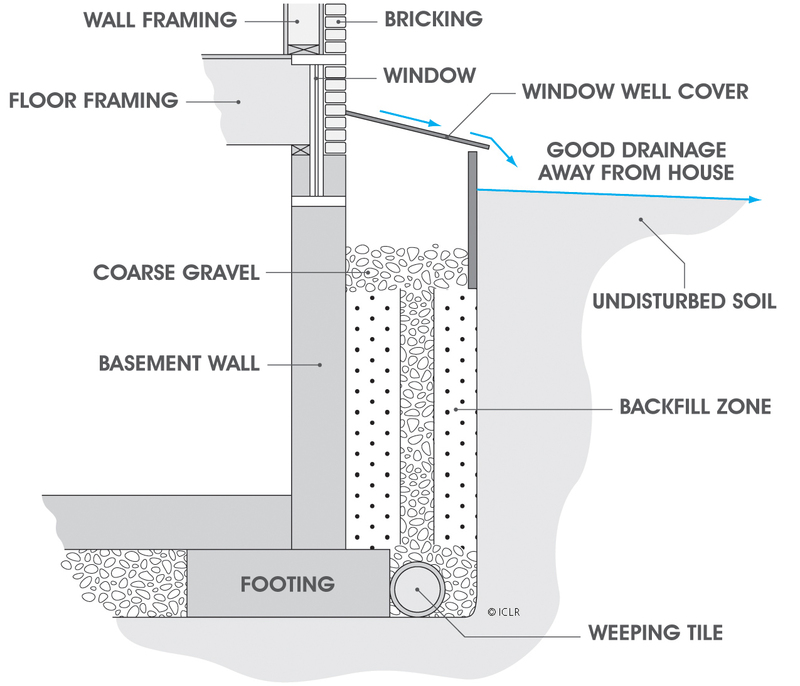 Proper lot grading around window wells is also important, as is consideration for window well covers for particularly flood prone window wells.